Voted by Great British Food Magazine as one of their Top 5 Juicers on the market, if you're looking to lose weight, give fitness levels a boost or just improve your health in general, choose the VonShef Professional Fruit Juicer. 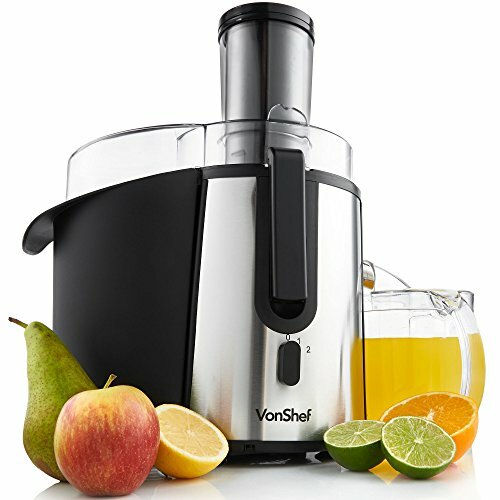 Use the VonShef Juicer regularly and you could see positive results and enjoy a healthier, happier lifestyle all round! Easy to clean - all removable parts are dishwasher safe for convenient juicing and minimum fuss. Size : 16 x 15 x 12 inches approx. The VonShef Juicer has a maximum power of 700W and comes with numerous removable parts designed to produce high quality juice again and again. Included in the juicer is an extra-large transparent 70oz detachable pulp container, cleaning brush, plunger, juicer collector, blade and transparent blade. All removable parts are dishwasher safe. Pour the juice into a glass and serve immediately. Alternatively, for a creamier drink, transfer the juice to a food processor or blender, add a couple of ice cubes and process briefly. The safety features of this juicer prevent it from starting unless it is correctly assembled. Please follow the directions in the instruction manual. Size:16 x 15 x 12″ approx.